In the first 18 days of 2011, mudslides shut down highways and threatened homes in California, Oregon and Washington. However, they are certainly not exclusive to the West Coast. The U.S. Geological Survey tallies $1 billion to $2 billion in annual damages and at least 25 deaths each year due to landslides and mudslides, which occur in every state and territory, and nearly every country in the world. Mudslides are most likely on slopes or at the base of hills and slopes. The USGS notes that stable, hard bedrock and flat areas away from slopes are the only areas considered safe from landslides. For other areas, here are a few tips on protecting your home from an expensive and potentially deadly natural disaster. Find out about past mudslide activity in your area, and find any projections for mudslide danger on your property. Here is a map with links to each state’s geological survey office, which should have detailed maps and information for your area. The state geologist can also recommend skilled local professionals to help with mudslide protection. • Sticking doors and windows, which may have slipped out of plumb when the ground shifted. Proper landscaping and hardscaping can help minimize the danger of mudslide damage. Keep plants trimmed to less than 18 inches high near buildings. Large heavy plants can break loose and cause severe damage. Also keep plants watered and healthy. If your property has any barren areas or spots with dead and dry vegetation, plant over them to help hold the soil in place. Consult a savvy local landscaper about landscaping for mudslide protection. Use sandbags, concrete trapbags and lumber to direct flowing mud and debris away from your house and other structures (while not creating even bigger problems for downslope neighbors). Be sure to divert rather than confine the flow. Trying to dam or trap the flow will likely lead to a more dangerous situation and heavier damage if the mudslide overflows your trap. During heavy storms, if mudslides are a threat, board up windows to prevent debris from breaking through them. Beyond these stopgap measures, the Red Cross recommends calling in professionals if you have a home in a mudslide-prone area. Geotechnical engineering and civil engineering companies can offer advice and help on moving earth and taking other major steps to combat mudslide damage. Also work with neighbors on a coordinated mitigation plan. The group also suggests installing flexible water and gas pipe fittings that will be less likely to break if the ground shifts. If utility lines break, be sure you know what number to call to have the gas or water shut off as soon as possible. If possible, raise your furnace, water heater and electric panel out of the flood-prone parts of your house. This can keep the heat and electricity flowing, and avoid costly repairs. Standard homeowners insurance often does not cover mudslide damage. Look for a policy that offers additional mudflow, mudslide and landslide riders (each type of damage has a unique definition and may require different coverage). The coverage, if available, could cost at least $1,000 more on a $300,000 home. 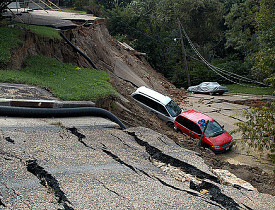 Mudslides can happen very quickly in any state, and cause extensive damage. Protect your home with proper landscaping, diversion measures and professional mitigation assistance. Minimize damage by moving utility lines and appliances, and protect yourself with full insurance. Also make and share an emergency evacuation plan with your family. Have emergency supplies ready to go, and keep in mind that mudslides may block or wash away roads.